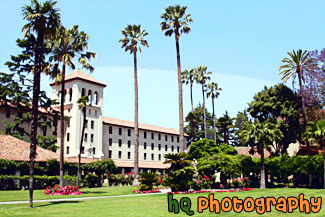 A scenic picture taken of Nobili Hall which is located near mission gardens on campus at Santa Clara University. Blue sky, palm trees, and flowers make this a beautiful picture. A scenic photo of the Mission Gardens and Nobili Hall located at Santa Clara University on a beautiful sunny day with bright blue sky. 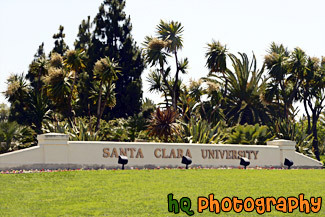 Santa Clara University is located in the heart of California's Silicon Valley. It offers a rigorous undergraduate curriculum in the arts and sciences, business, and engineering. It has nationally recognized graduate and professional schools in business, law, engineering, pastoral ministries, and counseling psychology and education. The 8,047-student, Catholic, Jesuit university has a 153-year tradition of educating the whole person for a life of service and leadership. 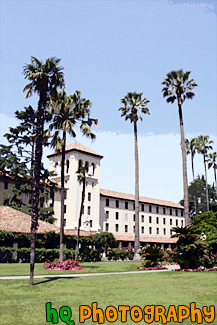 Santa Clara was founded in 1851 by the Society of Jesus as "Santa Clara College," is California's oldest institution of higher learning. It was established on the site of the Mission Santa Clara de Asis, the eighth of the original 21 California missions. At the center of the campus is the Mission Santa Clara de Asis, surrounded by the roses and palm trees of the historic Mission Gardens. This picture was taken of the Mission Santa Clara de Asis from the side of it with a picture of a palm tree in the background. Mission Santa Clara de Asis is located at Santa Clara University and is a very beautiful site to see. At the center of the campus is the Mission Santa Clara de Asis, surrounded by the roses and palm trees of the historic Mission Gardens. 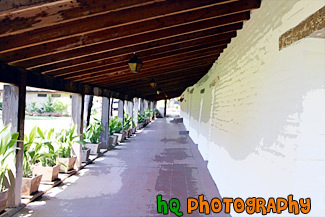 A scenic picture taken of the walkway of the Adobe Lodge located on campus at Santa Clara University in Mission Gardens. 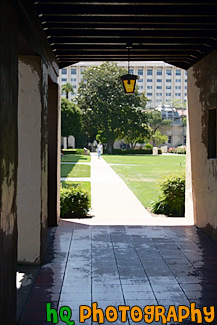 A scenic picture taken at Santa Clara University from the right side of Mission Santa Clara de Asis looking out towards Santa Clara's main entrance. This campus is very beautiful as it is covered with these pretty palm trees, beautiful flowers, and wonderful architecture. You can also see the scenic green hills of San Jose in the background. These hills make this view even more beautiful as its not always that these hills are this green. 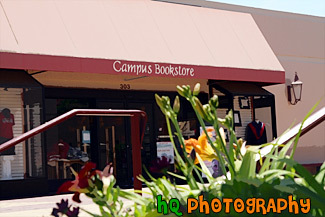 A scenic picture taken of the Santa Clara University Campus Bookstore. The bookstore is located right next to Benson Center. 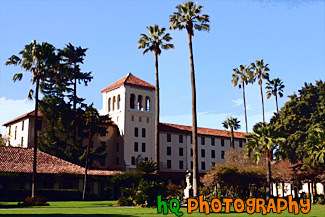 A scenic picture taken of palm trees surrounding the entrance to Santa Clara University which is located in the silicon valley of California. 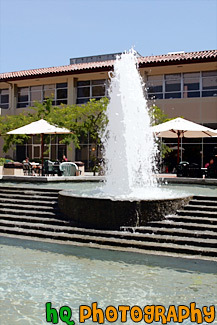 A scenic vertical picture taken of the fountain located outside of Robert F. Benson Memorial Center. Benson is the hub of campus life, offering many services, including dining and conference facilities and a number of student organizations. A scenic picture taken on campus at Santa Clara University at Mission Gardens. Fountains are seen in this picture which was taken on a cloudy morning. 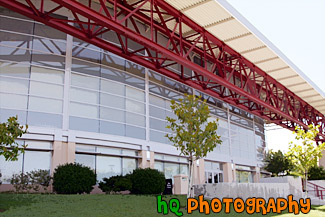 A scenic vertical picture taken of the front of the Leavey Event Center on a sunny day. 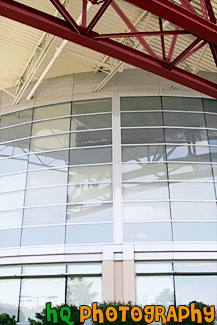 The Leavey Event Center is located on campus at Santa Clara University, and it is home to many sporting events such as basketball and volleyball. 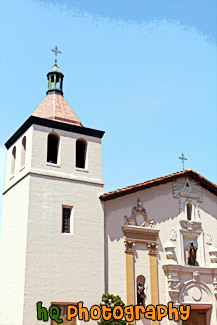 A scenic vertical picture taken close up of the Mission Santa Clara de Asis church located in the center of campus at Santa Clara University. The Mission Santa Clara de Asis is the eighth-oldest mission site in California. 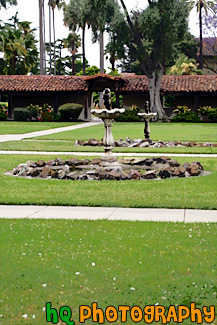 The Mission and surrounding gardens are very popular sites for weddings, concerts, and events. 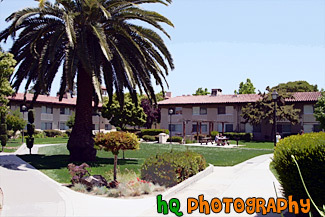 A scenic picture taken of the Graham Residence Hall located on campus at Santa Clara University. Graham is located right across from the Learning Commons, Technology Center and Library. Graham used to have a pull located in the center of the buildings, but now lawn fills that area. 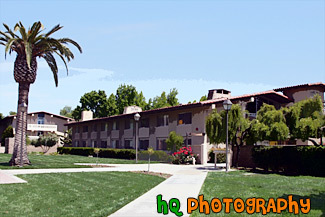 A scenic picture taken of the Graham Residence Hall located on campus at Santa Clara University in Califorina. This photo was taken on a blue sky sunny day. A palm tree and green grass is also seen in the photo. 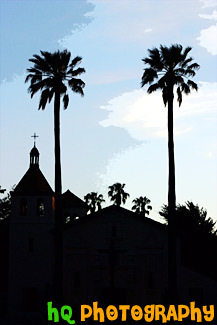 A scenic vertical picture taken of the historic Mission Santa Clara de Asis church located in the middle of campus at Santa Clara University in California. 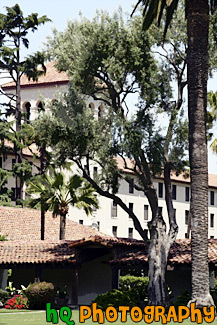 A scenic vertical picture taken of Kenna Hall located on campus at Santa Clara University in California. 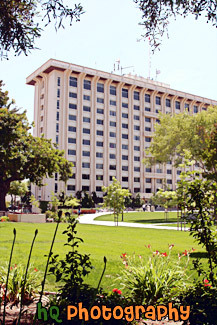 Kenna was renovated in 1967 when it became home to the Leavey School of Business. It is located right across from Benson Center. 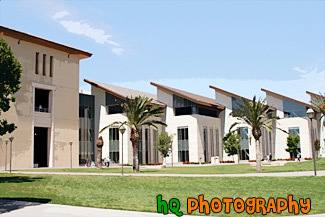 A scenic vertical picture taken of the Learning Commons, Library, and Technology Center at Santa Clara University. 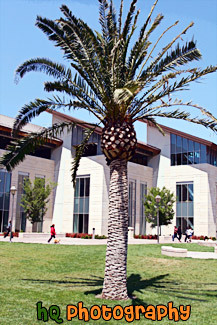 A palm tree is seen in front of the building. The library is an intellectual hub on campus, a destination spot for students and faculty, where they can access information resources, get assistance in using those resources, and enjoy work spaces that meet the needs of both private study/research and group collaboration. A scenic picture taken of the Leavey Event Center at Santa Clara University in California. The Leavey Event Center was built in the 1970s to replace the aging gymnasium, and originally had an air-supported dome roof. Basketball and volleyball games are held in this gym. 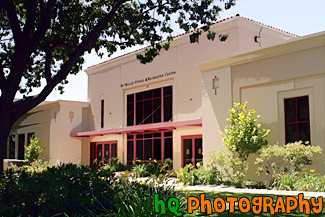 A scenic picture taken of the Leavey Event Center located on campus at Santa Clara University. One car is seen in the parking lot. The Leavey Event Center was built in the 1970s to replace the aging gymnasium, and originally had an air-supported dome roof. It was renovated in around 2003 to replace the air-supported dome roof with a regular roof. 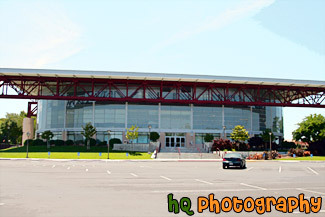 A scenic vertical picture taken of the Leavey Event Center at Santa Clara University. The Leavey Event Center was built in the 1970s to replace the aging gymnasium, and originally had an air-supported dome roof. Basketball and volleyball games are held in this gym. A scenic picture taken of the Mission Santa Clara de Asis, which is located in the center of campus at Santa Clara University. This photo was taken just after class got out as you can see students walking in front. A close up scenic vertical picture taken of the Mission Santa Clara de Asis church located on campus at Santa Clara University. Blue sky is seen in the background. 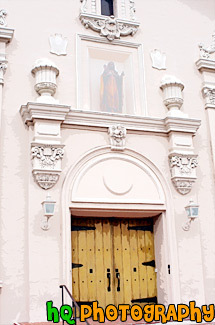 A close up picture taken of the Mission Santa Clara de Asis church located on campus at Santa Clara University. This is a picture of the front side of the church. 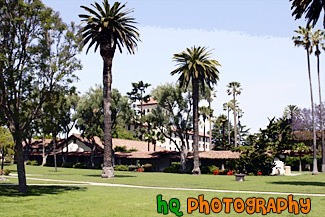 A scenic picture taken of Nobili Hall and the Adobe Lodge surrounded by green trees and palm trees in mission gardens at Santa Clara University in California. The Adobe Lodge was built in 1822 and is the oldest building on campus. 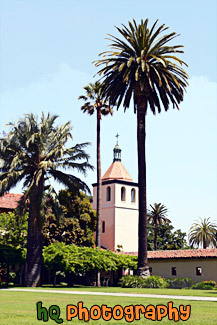 A scenic vertical picture taken of Nobili Hall and tall palm trees located in mission gardens of Santa Clara University in California with blue skies seen above. 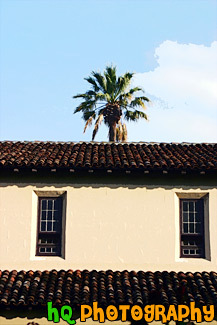 A scenic vertical picture taken of Nobili Hall located near mission gardens on campus at Santa Clara University. Part of the Adobe Lodge is also seen in the foreground. A scenic vertical picture taken of Nobili Hall which is located near the mission gardens on campus at Santa Clara University, California. It was built in 1930 as a student dormitory and dining hall. For many years it served as housing for resident Jesuits; today it is again used for student housing, as well as study halls during the construction of the new Learning Commons and Library. 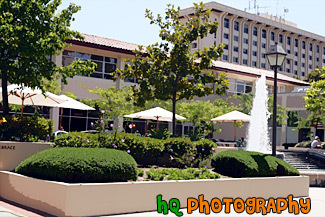 A scenic picture taken of the tables, water fountain, and umbrellas outside of Benson Memorial Center located at Santa Clara University. A scenic picture taken close up of the Pat Malley Fitness & Recreation Center located on campus at Sant Clara University. This is the fitness center in which students and faculty are able to go get a workout at. 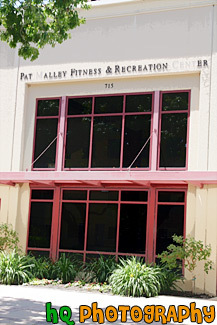 A scenic vertical picture taken of the Pat Malley Recreational Gym entrance located on campus at Santa Clara University. A scenic vertical picture taken of the Sacred Heart statue located in mission gardens at Santa Clara University. 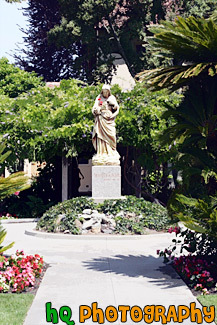 Since the original placement in 1884, the Sacred Heart statue has been the focal point of the Mission Gardens. 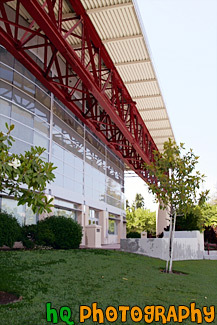 A scenic picture of the newly remodeled Santa Clara Library also called the Learning Commons for undergraduate students. This photo was taken on a sunny, blue sky day. A scenic vertical picture taken of a girl walking on a sidewalk in mission gardens at Santa Clara University. This college is the oldest college in California. This photo was taken under a pathway right by the historic Mission Santa Clara de Asis church. The Swig dorms can be seen in the background. 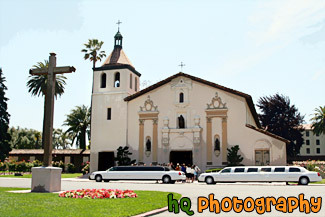 A scenic picture taken of the Santa Clara University Mission Church with two limousines seen in front of the church on a sunny blue sky day. Many weddings are planned at this historic church. 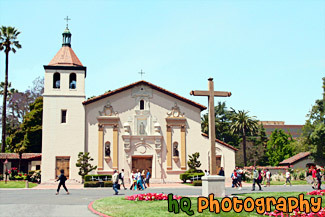 A scenic photo of the Mission Church located at Santa Clara University on a beautiful sunny day with bright blue sky. 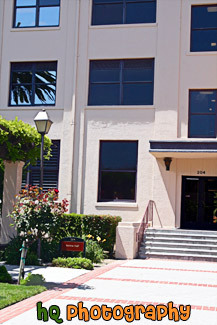 Santa Clara University is located in the heart of California's Silicon Valley. It offers a rigorous undergraduate curriculum in the arts and sciences, business, and engineering. It has nationally recognized graduate and professional schools in business, law, engineering, pastoral ministries, and counseling psychology and education. The 8,047-student, Catholic, Jesuit university has a 153-year tradition of educating the whole person for a life of service and leadership. 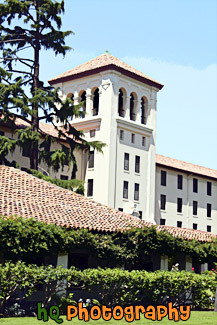 Santa Clara was founded in 1851 by the Society of Jesus as "Santa Clara College," is California's oldest institution of higher learning. It was established on the site of the Mission Santa Clara de Asis, the eighth of the original 21 California missions. 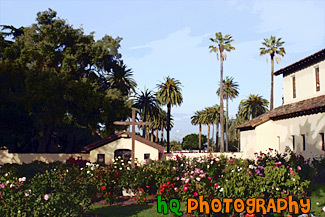 At the center of the campus is the Mission Santa Clara de Asis, surrounded by the roses and palm trees of the historic Mission Gardens, which is where this photo was shot at. 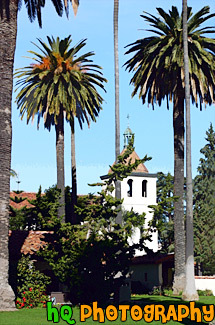 A scenic vertical picture taken of tall palm trees, blue sky, and the Mission Church seen in the background at Mission Gardens on campus at Santa Clara University in California. 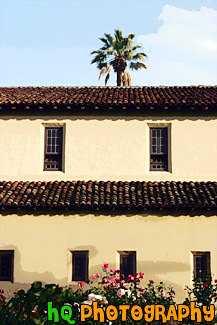 A scenic vertical picture taken of the back side of Mission Santa Clara de Asis with blue sky seen above. 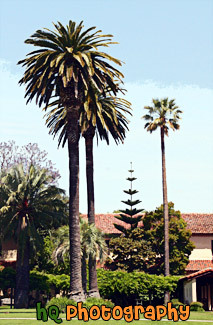 This photo was taken from the mission gardens located in the center of campus. 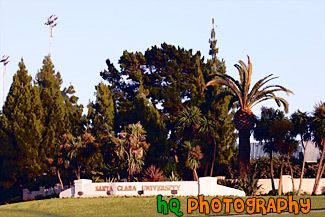 A close up picture taken of the Santa Clara University sign located at the entrance to the campus. 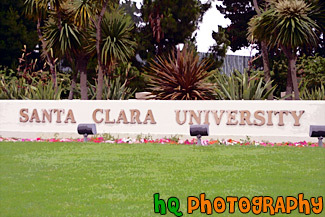 A scenic picture taken of the sign located at the main entrance to Santa Clara University which is located in Santa Clara, California. 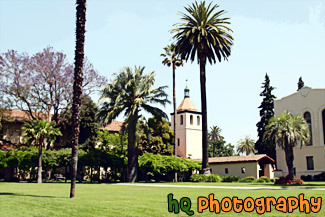 A scenic picture taken of the mission gardens and Nobili Hall seen in the background with palm trees all around. The Adobe Lounge is seen in front of Nobili Hall. Mission Gardens is a beautiful and popular site for public and private gatherings, the Mission Gardens is a peaceful area on campus located behind the Mission Church. 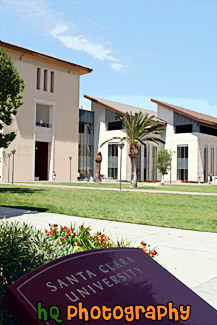 A scenic vertical picture taken of a Santa Clara University sign in the foreground and the Learning Commons building in the background. This picture was taken on a sunny, blue sky day. 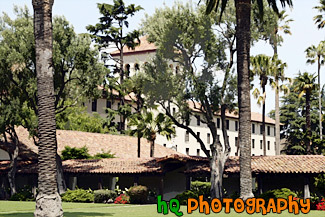 A scenic picture taken of the Mission Santa Clara de Asis located on the campus of Santa Clara University. This picture was taken as the sun was setting as you can see the changing sky color the silhouette of the Mission Church. 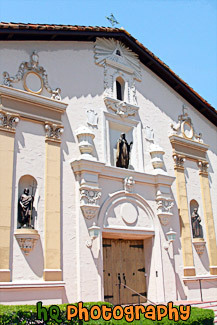 This site in which the Mission is located is the fifth as floods, earthquakes, and fires forced the Santa Clara de Asis Mission to move five times. 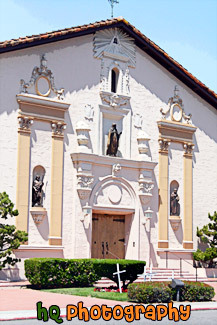 Each of the five mission sites are commemorated on the Santa Clara University campus of in the City of Santa Clara. The original mission was founded in 1777 near the current site of the San Jose airport. This first church was built in 1825 by the Spanish with no decoration. Ten years later figures of saints were painted on the church facade. Over the next 90 years the facade was remolded twice. 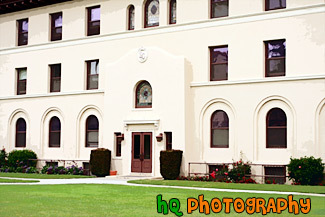 A close up picture taken of St. Joseph's Hall which is located on campus at Santa Clara University in California. This is taken of the back side of the building which is facing Mission Gardens. St. Joseph's Hall was built in 1911. 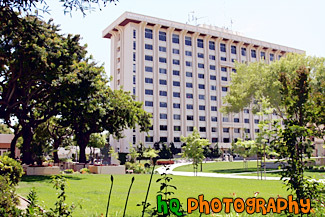 A scenic picture taken of the Swig Residence Hall located on campus at Santa Clara University. Green grass, trees, and blue sky are seen in this photo. Swig is located next to Benson Center.